Explore our range of single origin coffees and browse our new roasts here. We send them out in post-box friendly 250g bags. Fazenda Um is one of the FAF (Fazenda Ambiental Fortaleza) associated farms. This espresso has a complex flavour of marmalade and caramel. With milk, this coffee tastes like caramel biscuit with a subtle honey aroma and finish with brown sugar sweetness. Paraíso Tropical is a double anaerobic drying process which creates a memorable sensorial coffee experience. Lactic, sweet & complex this coffee has notes of strawberry and banana. This Castillo lot is a sister coffee of the of the finalist at COE (Cup Of Excellence) in Colombia this year. Kabingara AB is a sweet and clean Kenyan coffee. 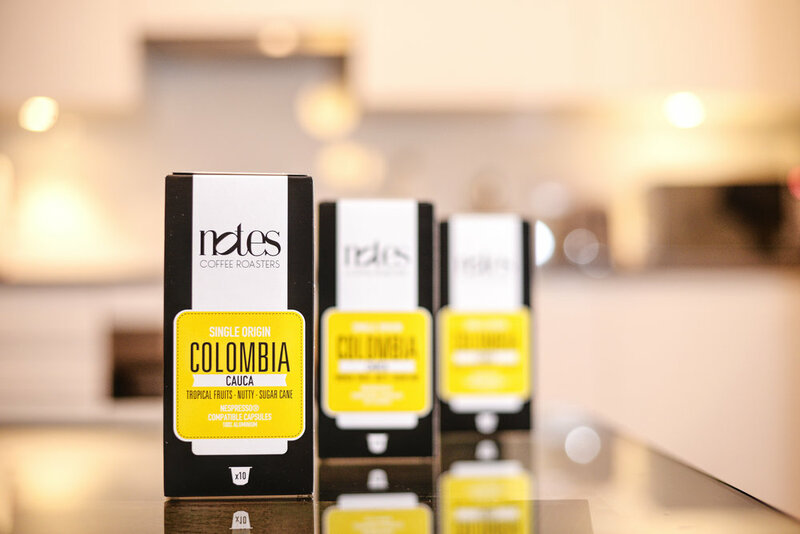 It has a distinctive citric acidity evocative of lemon. With a brown sugar sweetness, syrupy body and orange zest aftertaste, it makes for a very complex cup. Ninho D’Águia is a sweet and balanced Brazilian coffee. From the high mountains in Minas Gerais state, this natural coffee has notes of milk chocolate, almond butter, raisins and praline. This Colombian espresso has a juicy body. Expect notes of dark chocolate, dried mango and brown sugar, with milk this coffee tastes like a chocolate caramel. A great gift for the Notes coffee lover in your life! 6 x 250g coffee bags delivered to their doorstep weekly, fortnightly or monthly. A subscription is the best way to guarantee a regular fresh delivery straight to your home or workplace. Just let us know if you'll be brewing espresso or filter. Aside from making some pretty tasty coffee for you, we also have a small selection of tools and equipment to weigh, grind and filter your daily brew. We've hit the big time! Our name on a cup, a Keep Cup no less! Now you can carry your hot or cold drinks whilst totally repping us and being environmentally conscious. Comes in Small or Medium size. Buy a Keepcup & Enjoy a Free Espresso Maritni + 10p discount on each coffee. If you yearn for that perfectly brewed coffee then this digital scale should be the perfect tool in your coffee-making ventures. 40 in each pack, these filter papers are designed to fit snugly into the V60 01 brewer. This is great little brewer for home use, carefully developed by those clever people at Hario. A great gift for the Notes coffee lover in your life! 5 drinks, to have in or take away. Learn to pour like a pro with an introduction to roasting, making espresso & pouring beautiful latte art. Brunch will be served after the class! Classes are on Saturday mornings in our Victoria branch, we will be in touch to arrange your date. 10 drinks, to have in or take away. Free P&P with every order of coffee(s). £1.50 P&P charge added on all our coffee products and merchandise. All prices inclusive of vat.